ACEN–Working Websites,Hosting,portfolio,status,bidding,library,news,search engine registration, & email at your domain name. To attract leads from your website, show off everything you do! Portfolio™ makes it easy. You can add a webpage in just minutes by filling-out a simple form. Add photos directly from your digital camera -- Portfolio™ software automatically crops and optimizes for fast web viewing. Every web page that you create using Portfolio™ includes a photo, bullet-point highlights, a web link, a document link, a 12-photo slide show and an all-important feedback link. When visitors see what they were looking for, they’ll email you. Portfolio™ is great for businesses with an abundance of products, services, properties, or success stories. And don't worry about digital photography. 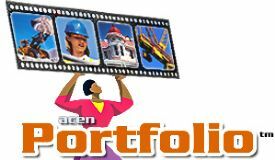 Portfolio™ automatically processes the pictures to make them appear in your website sharp and fast. You won’t need software or special skills -- it's a do-it-yourself tool! Portfolio™ is a one stop marketing solution. Every Portfolio™ page is automatically composed into an attractive, letter-size and printable PDF document. Use Portfolio™ to support your sales force with printable marketing material anywhere they go online. To see an example of Portfolio™, look no further! We use Portfolio™ to display our products!